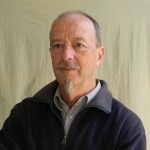 Born in Castlemaine in central Victoria, Dennis was educated at Harcourt North primary school, Castlemaine Technical School and finally completing a Diploma of Art (Painting) at the Royal Melbourne Institute of Technology. Dennis spend two years in industry, spending twelve months at Neon Electrics and the remainder painting stage scenery at the Princess Theatre in Melbourne. The next thirty years were spent teaching art in the Victorian Education Departments Technical School and Technical and Further Education divisions. 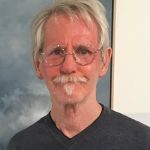 Throughout this teaching career Dennis has continued his to practice his art in the forms of painting, drawing, printing, ceramics and leadlighting. 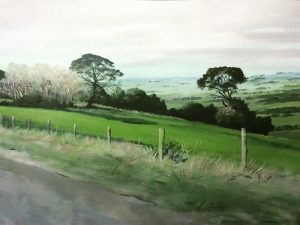 In latter years he has completed around thirty murals throughout Gippsland and continued to paint, draw and be involved in ceramics with his wife Beverly who is well known in the Art Makers Markets circuit. 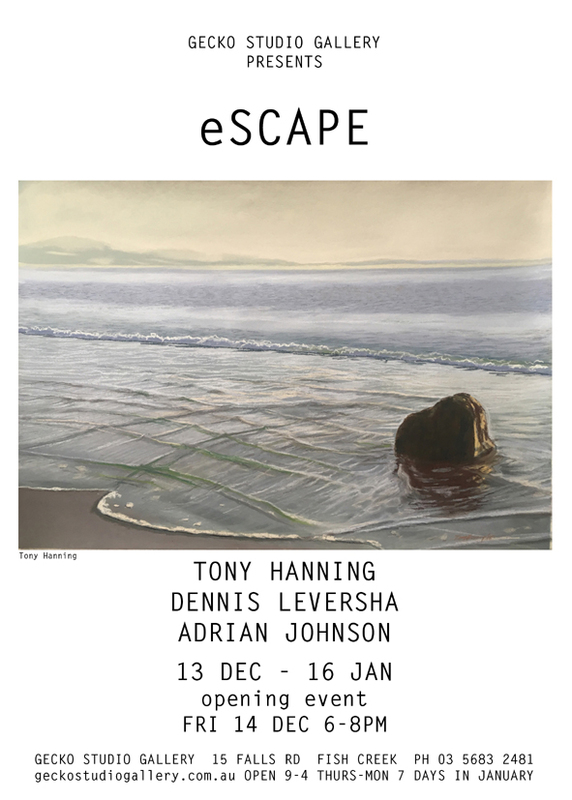 Dennis’ work is largely figurative, the landscape being a favourite subject. Always looking for strong design elements, he tries to capture the essence of the subject matter as well as its visual appearance. Dennis hopes to continue this work as he and Bev tour this continent of ours and shares his images with the people around him. 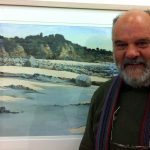 Adrian began his painting journey in the early 80s by joining the Wonthaggi Art Group. 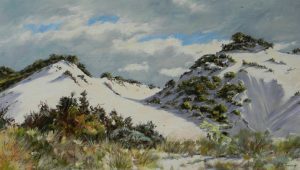 While attending workshops he was able to gain sufficient knowledge of the painting process to develop his own style of capturing the light in the landscape. 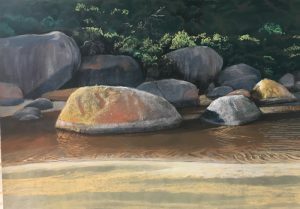 Australian impressionists Peter Smales, Max Wilks and English painter David Curtis have been a source of inspiration and learning. 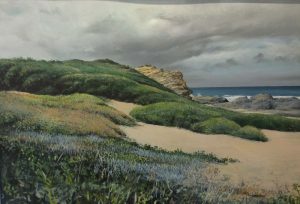 Adrian has exhibited and painted extensively throughout Victoria and NSW with water colour artist Bob Pelchen. 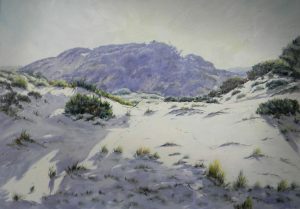 The Southern Grampians and the high country around Mansfield and Mt Buller have provided spectacular ‘plein air’ painting challenges in recent times. 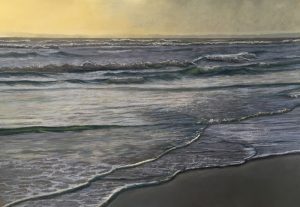 Adrian is a past recipient of the Bass Coast acquisitive award and has been invited to judge at many local art shows. He has a long association with the Australian Guild of Realist Artists ( AGRA ). In 2011 he was awarded a guild fellowship for outstanding achievement. ‘I try to achieve a determined work practice to help solve problems that may arise during the painting process. Varying my technique and subject throws up many challenges. I believe working in this manner improves my development as a landscape painter’. International Glass 60 Artists in the V&A. Jennifer Hawkins Opie: V&A Publications 2004.